Here is our first Cooking with Sherry Recipe. 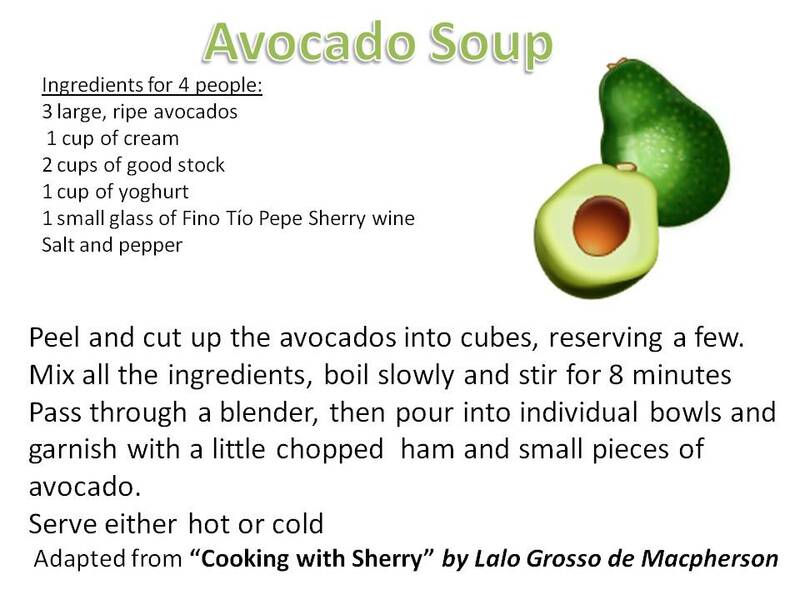 We have chosen this great Avocado soup from the book by the same name, “Cooking with Sherry” by Lalo Grosso de Macpherson. The original book in Spanish was published in 1982, the English translation in 1987. This book has been with me in Las Palmas, in the Canary Islands; Fort Collins, Colorado; Phoenix, Arizona; Gines, Sevilla; El Paso, Texas; and is now in El Puerto de Santa María where I still look up its recipes. Enjoy! Aquí está nuestra primera receta “Cocinando con jerez” esta basada en el libro maravilloso de Lalo Grosso de Macpherson, “El Vino de Jerez en la Cocina Universal” publicado en 1982. Este libro me ha acompañado durante años. Ha estado en Las Palmas, Fort Collins Colorado; Phoenix, Arizona; Gines, Sevilla; El Paso, Texas y ahora está en El Puerto de Santa María donde sigo consultando sus recetas. ¡Que la disfrutéis! 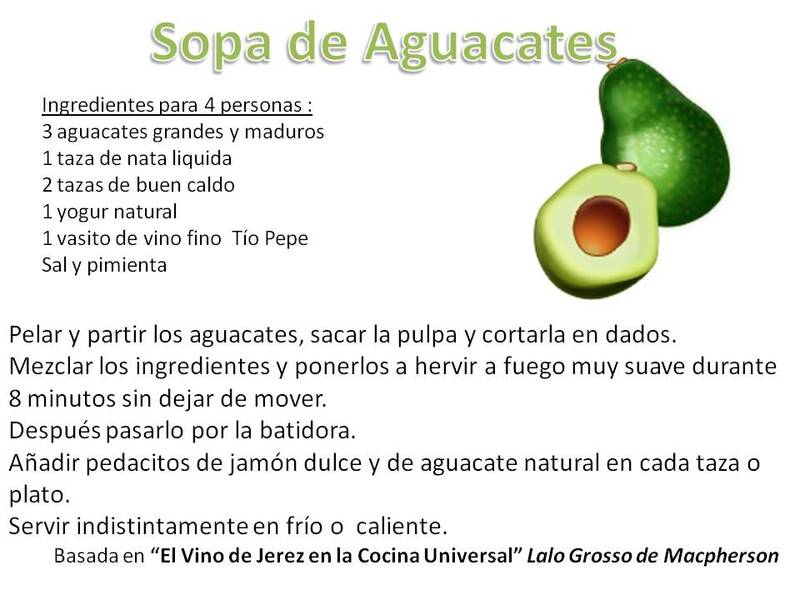 That does sound unusual and delicious; I love avocados but have never made soup! We had almejas with Tio Pepe for dinner tonight – usually with white wine, but wanted to try with sherry. Fun to experiment. Love author’s name, Lalo Grosso de Macpherson. Wonderful Spanish-Scottish mix. Lalo Grosso´s book is amazing, I will be posting some more recipes soon. The almejas with Tío Pepe are a classic hope you enjoyed them!